Meet the BranDD AmbassaDDor: Danica from UNH! My name is Danica and I’ve lived in a small New Hampshire town my whole life. I’m studying Tourism Planning and Development at the University of New Hampshire (UNH) and dual minoring in Geography and Communication. After graduation, I hope to find an opportunity to travel more and find a job. As a sophomore, I’ve found that the UNH campus offers a diverse student body that acts as a family (or pride, as us Wildcats call it). UNH might be a bustling, larger state school, but it still provides the quintessential ‘New England’ feel with changing seasons, a diverse community and a historic downtown. 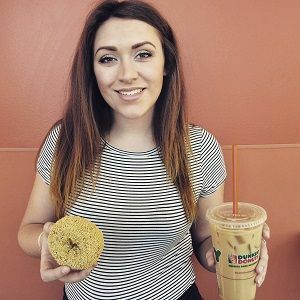 Dunkin’ Donuts is a New England staple, therefore being a BranDD AmbassaDDor has allowed me to further submerse out-of-state students and students from other countries into the New England culture. 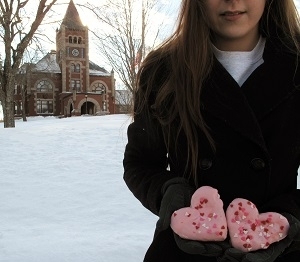 The on-campus location was thoughtfully placed in the Memorial Union Building, which attracts students from all over campus for food, events, club and organization meetings, studying, and “Dunks” of course. Our Dunks is centrally located at a major hub of activity, making it accessible to all students. I’m constantly seeing a Dunks cup in everyone’s hand when I walk around campus. 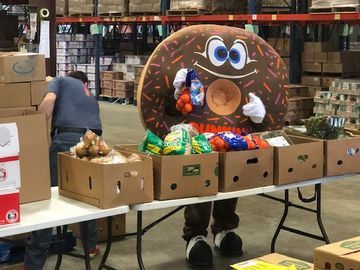 The events that Dunkin’ Donuts is involved in at UNH range from small to large-scale. For example, I held a meet-and-greet for students after a campus-run yoga lesson and offered them DD giveaways, DD Hot Chai and an easy way for them to sign up for DD Perks®. At smaller events like these, it’s nice to connect on a personal level with the student body and learn about my colleagues. 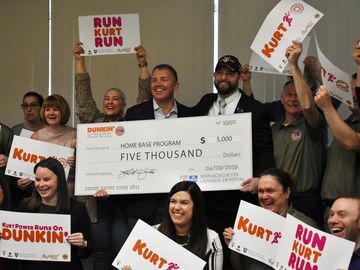 On the other hand, Dunkin’ Donuts will be presented as a sponsor for the “Stepping Out to End Violence Rally and Walk,” which will draw a crowd of nearly a thousand students. 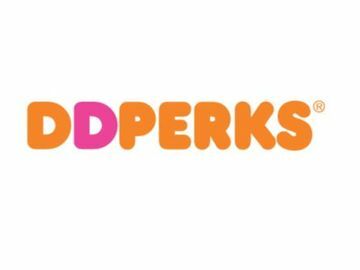 There, Dunks will show its support for ending domestic violence by offering food and an activity called “Dunks for Change,” where participants can play “DD,” our form of the basketball game, “PIG,” for a Dunks-themed prize. Lastly, each student will give a three-second video response that will be pieced together, for a video recap of the day. Using social media and events to connect Dunkin’ Donuts with the Wildcat ‘Pride’ has been exciting and rewarding, and I look forward to fostering the relationship over the rest of the semester. You can follow Dunks at UNH on the Instagram account: DDcampusrepUNH.